For savers shopping worthy 5-year CD rates, 2016 has been a year of dashed hopes. Though the Federal Reserve raised interest rates in December 2015, the top yields in the major CD terms didn't just fail to rise — some actually dropped. Searching Bankrate's extensive database of the day's best CD rates shows that 60-month yields have been hit especially hard, sitting almost two-tenths of a percentage point lower now than in December 2015. Fortunately, local deals from credit unions and community banks continue to pay up to three-quarters of a percentage point more than the leading national return — over 3% in one instance. But when will long-suffering savers finally see some improvement among national offers? It depends on how banks react to what we expect the Fed will announce this week. We'll fill you in on the details. Today's top 5-year return sits at 2.27% APY, down from the 2.45% APY you could earn at the time of the Fed's hike. The drop in the lead only tells part of the story, because while in December savers could earn more than 2.00% APY from 16 national banks, that had dwindled to just two banks until recently. 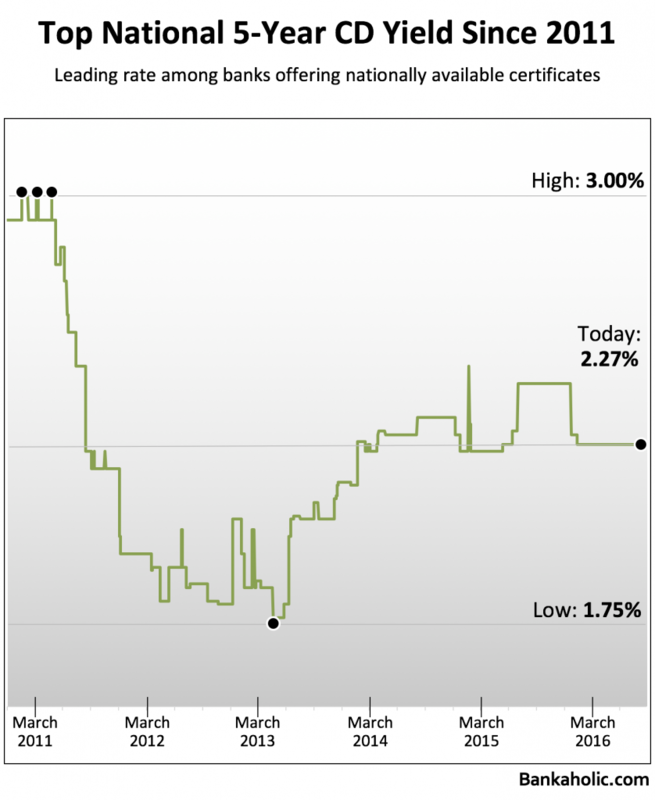 Fortunately, the number of national CD offers above 2.00% has since risen to five banks, after a handful of banks increased their long-term rates over the past month. The current leader, paying 2.27% APY, is still State Bank of India-Chicago, which is a U.S. branch of India’s largest bank and is FDIC-insured. It has held the top spot alone for four months now. While today's leading rate is a letdown from last December, it's good to remember that it's still high above the term's post-recession low of 1.75% APY, endured in the spring of 2013. 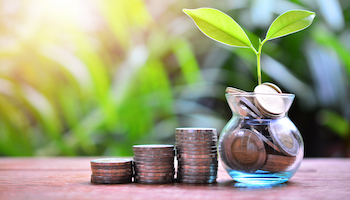 Of course, there are always some lucky savers who can outearn the top national rate with certificates of deposit from a community bank or credit union. These institutions often offer chart-topping yields to savers who live or work nearby or are willing to jump through a hoop or two. Here's a baker's dozen of worthy deals, paying qualified savers as much as 3.05% APY on 5-year terms. One of the credit unions even accepts members nationwide. As always on the deals below, eligibility requirements will apply. So contact the bank or credit union directly to determine if you qualify. If you think you might qualify for any of these deals, they're worth investigating because they pay about three times more than the current average 5-year return of 0.82% APY, according to our weekly nationwide survey of banks and thrifts. The average return bottomed out at 0.77% APY in the summer of 2013 and gradually rose to 0.89% APY in spring 2015. But since the Fed's hike in December 2015, it's eroded from 0.85% to 0.81% APY. Rewind to February 2007, before irresponsible mortgage lending led the economy over a cliff. Back then, the national average return for 5-year CDs was 4.02% APY. But with the financial crisis throwing the economy into a tailspin, the Federal Reserve applied the brakes not only by repressing interest rates to record lows in 2008 but by keeping them anchored there for seven years. That historic era in the Fed's timeline officially ended when it made a small rate increase in mid-December 2015. Although the Fed had indicated it would gradually push interest rates higher over the next several years, global and economic news in 2016 has given the rate-setting committee pause. Indeed, seven of the committee's eight 2016 meetings have come and gone without any announcement of a further rate increase. But at this week’s Fed meeting, most economists and Wall Street forecasters finally expect Hike #2 to be announced. When that does happen, we hope banks will finally begin to react, as 5-year CD rates could certainly use the boost. Disclaimer: The rates above were verified Dec. 12, 2016. Credit unions and community banks should be contacted directly to determine eligibility for opening accounts with that institution, as well as to verify current rates.